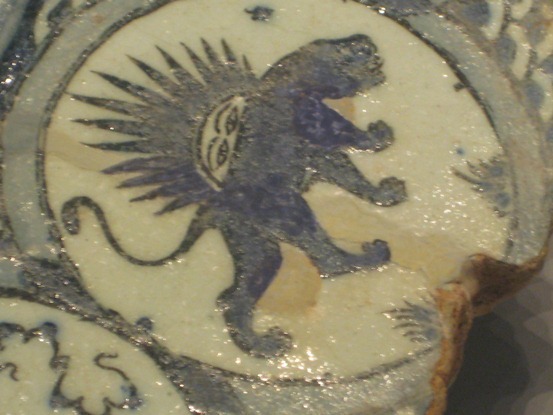 ORIGINS: The standard Western Zodiac, which is the focus of this website was originated in the Babylonian civilization, close to the turn of the 1st millennium BC and was later transmitted to the west by the Hellenistic Greeks. The so-called Tropical Zodiac is fixed to the Earth seasons and always starts in the spring equinox with the sign of Aries. The so-called Sidereal Zodiac is based on the Earth’s position in relation to the stars. The precession of the equinoxes slowly shifts the spring equinox-zodiac alignment. THE ZODIAC CONSTELLATIONS: The Western Zodiac consists of 12 signs that are abstracts of 12 corresponding stellar constellations, marking the path of the Sun in the Earth’s sky throughout the year. In other words, these constellations form a celestial band which is an extension of the Ecliptic Plane (the plane defined by the planetary orbits) to infinity. The distribution of the 12 constellations around this band is more or less equal, with some variation. During one year, each sign is associated with a period of about a month that roughly corresponds to the time the Sun spends in that constellation. 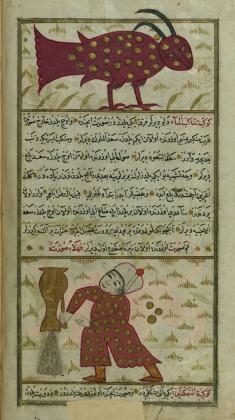 The table here lists the zodiac signs, each with its particular abstract symbol, the meaning of its name, and the month that the Sun spends in the respective constellation. 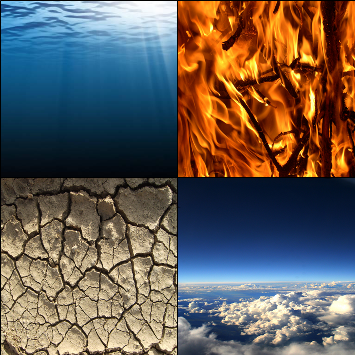 THE FOUR ELEMENTS: The zodiac signs are divided into four groups of the basic elements – Fire, Earth, Air, and Water – based on their energies. – Fire signs are connected to spontaneity and impulsivity or the motoric function. – Earth signs are related to deep roots and slow changes or the instinctive function. – Air signs are about quickness, animation, and diversity or the intellectual function. – Water signs have to do with sensitivity and deep emotional lives or the emotional function. – The Hindu or Vedic version is a Sidereal zodiac also having 12 signs, which mostly correspond to the Western signs. – Both ancient Egyptians and Indians divided the zodiac circle into 36 Decans instead of the 12 signs. The ancient Greeks coined this name which means Tenth, since every ten days a new decan appears just before sunrise at dawn. 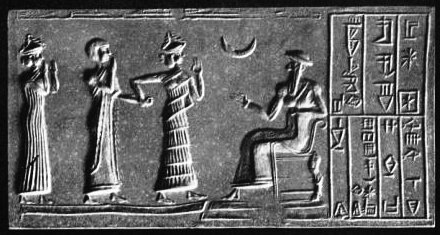 – The Babylonians, on top of being the originator of the Western SOLAR zodiac, also came up with a LUNAR zodiac. This systems used 28 Mansions or stations – 28 divisions of the same zodiac circle that the Moon followed throughout the month. – The Chinese zodiac, by the way, is not connected to real constellations. The single common thing to all of the systems that use the constellations as their reference is the use of the Ecliptic Plane as their basis. This plane, defined by the orbits of the Earth, the Moon, and all the planets around the Sun, is extended into infinity to define the band of constellations that in turn define the major influences on the Earth. The number of divisions along this band, and the celestial objects that are being followed through their path along this band (Sun or Moon) may be different between different zodiac systems. MAIN INFLUENCES: The main influence within the Western zodiac is transmitted by the Sun. 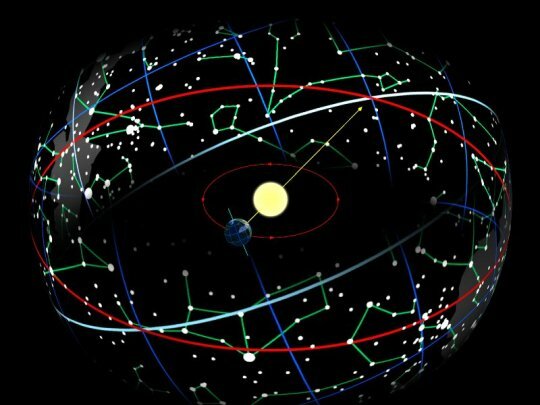 The location of the Sun against the backdrop of the zodiac constellations determines the zodiac sign of the month or the Sun Sign. By knowing your time of birth, it is possible to know what constellation was behind the Sun at that time, and therefore “your” sign. A secondary influence is the Ascendent Sign, which is the constellation rising in the moment of your birth. This depends on the time in the day of your birth as well as your place of birth. 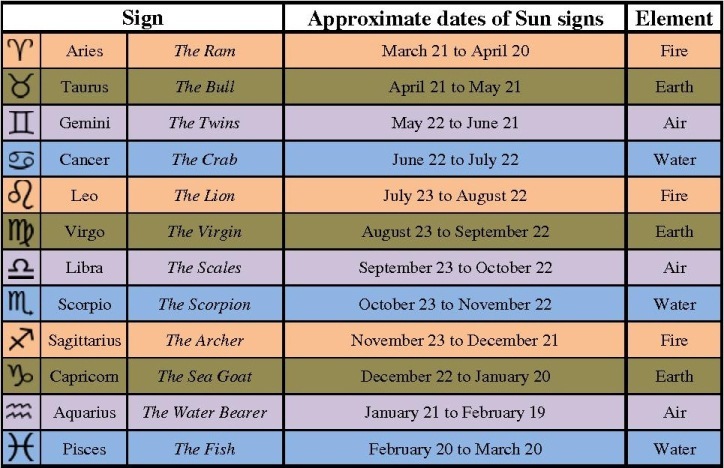 Generally, your Sun sign is the zodiac constellation rising with the Sun, since by definition, it is the sign where the Sun is during that month, and then, the following signs are rising about every two hours, since there are approximately equally spaced constellations going around over 24 hours. Remember, that the Horoscope according to which you were born in a certain Sun sign and you have a certain ascendant sign is true only for the time of the origination of the zodiac, which is 3000 years ago. In How It Works, it is explained how the entire zodiac system is shifting slowly due to the precession of the Earth’s axis. This means that is you were born in early April, the ACTUAL constellation that is rising at dawn with the Sun is not Aries anymore. Over the last 3000 years it has moved to Pisces and now it is in transition to Aquarius. The entire table that we show above has moved in the same way, almost two signs backwards. Another important influence is that of the Moon and the planets, which by definition, being on the Ecliptic plane, follow roughly the same path around the zodiac band as the Sun does. Two people having the same Sun sign and ascendant sign will have different characteristics if the Moon is in a different sign for them, or if Mars is in a different sign for them, or if the angle between Venus and Jupiter is different, and so on… The details of these influences, which are called Aspects are beyond the scope of AquarianSigns.com and there are many online sources that describe them. One additional influence that is important for our story is the cross influence between the zodiac signs near the borders that separate them. These are known as Cusps – the transition zone where the Sun is moving from one horoscope sign to the next. If, for example, you were born on November 20, the Sun was in Scorpio (according to the Tropical astrology), giving you the sensitive and emotional qualities of a Water sign. However, the active and fiery but emotionally repressed Sagittarius being just days away, will give the Scorpio a unique smart flavor. Generally then, people born on the cusp between two zodiac signs have qualities found in both signs or a blend of traits in their individual nature. The image on the right shows the transition between Capricorn and Aquarius. This “cross influence” is apparent during the last few days of a departing sign, and while the new sign is gaining its ascendancy, the influences of the old will persist but it will gradually lose its hold after about a week, and the new sign will be in complete control. People with the “classical” or “pure” influences of a sign are therefore the ones born within the middle two weeks of it. For Scorpio, that would roughly be November 1-15. This is very significant when trying to observe the transition between the Zodiac AGES, which show a similar cross influence throughout history. If we take the week-long cusp period on either side of the cusp and scale it up from the solar month to the grand month of 2150 years we get 500 years. That means that about 500 years prior to the actual precessional transition of the spring equinox, precursors of the new zodiac age start to appear. Some astrologers take it up even to one third of the month or about 700 years. After the transition is complete, the old zodiac age will still have some influence, but it will diminish for the next five centuries. As discussed in How it Works, the transition between the zodiac ages is reversed compared to the solar zodiac. There a few interesting historical examples of this cross influences between the zodiac ages. The appearance of the Buddha in the 6th century BC and the spread of Buddhism in the centuries following him occurred in the last few centuries of the Age of Aries (ending in about 100 BC). However, the teaching of the Buddha and the model of Buddhism were much more similar to the teaching of Jesus and Christianity (in global scope and in content), which were very much part of the Age of Pisces, then to any teaching or religion of the time of the Buddha. The Pharaoh Akhenaten and his new religion of the Sun God is an example of a failed attempt to move away from the Egyptian religion of Amun-Ra, represented by the Bull, after the Age of Taurus was already over and way into the Age of Aries. It is an example of a late dragging influence of the previous age over the new age. Eventually, Moses and the Israelites succeeded in the transition to a very similar religion to Akhenaten’s. Moses’ religion represents the classical Aries religion. In AquarianSigns.com we will follow the precursors to the Age of Aquarius as the spring equinox makes its transition to the Aquarian influence. The actual border line is approximately the year 2100, but the precursors are already here and now, as they have started emerging for the last few centuries.